Createspace Independent Publishing Platform, 9781490413587, 180pp. Parenthood is a beautiful journey. We don't have to become adversaries with our children; doing so is very unnatural to our humanity. We are all wired for connection, for closeness, and for love. Positive parenting frees us to move from the traditional parenting roles which create friction and rebellion and allows us instead to move into a more natural role which creates cooperation and peace. The inevitable conflicts that arise in a relationship no longer define the relationship, but serve as stepping stones to greater understanding and connection. There is an abundance of resources available which tell parents why traditional parenting practices are not optimal, but few help parents learn what to do in place of traditional practices. In this book, we'll discuss the principles of positive parenting, and then we will go through more than 40 scenarios to show you what it looks like when these principles are put into action. Show more Show less. Rebecca Eanes is the founder of www.positive-parents.org and independent researcher on attachment and child development. Her other works include The Newbie's Guide to Positive Parenting and The Couple's Guide to Positive Parenting to be released in 2013. She is an attached and blessed mother of two and married for 11 years now to her high school sweetheart and best friend for the past 17 years. 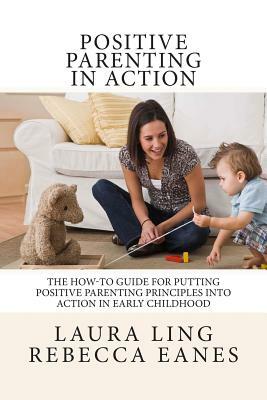 Laura Ling is an administrator on the Facebook page Positive Parenting: Toddlers and Beyond and mother of one. Her quest for positive parenting began when traditional advice began to feel too harsh and unsupportive. Although not a parenting expert, Laura researches child development, brain science, and emotional well- being in her 'spare time' and hopes to share what's she's learned for the betterment of society.